DNPE has been a leader in the Product Identification Industry since 1911. We deliver quality products at competitive costs. Our talented team is committed to providing you with the highest level of quality, service, and innovative solutions. 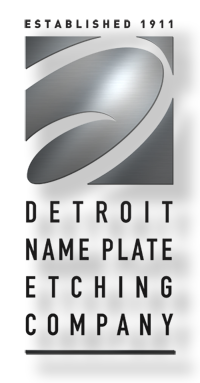 Whether you’re thinking about how nameplates can benefit your business/product or ready to place an order, it’s important to partner with a registered nameplate provider. 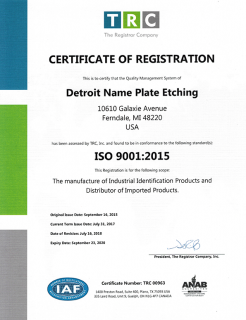 One of the most popular registrations is ISO 9001:2015, which is in quality management. By obtaining registration, an organization has demonstrated that it has adopted a quality management system as a strategic decision, that can help improve the overall performance of the organization and provides a sound basis for sustainable development initiatives. ISO9001:2015 can be used by any organization, large or small, regardless of its field of activity. In fact ISO 9001:2008 is implemented by over one million companies and organizations in over 170 countries. You can feel confident that your products will be manufactured by our experts at DNPE. After all, your name is on it.